The 336 counting pages book has a hard cover and is 28,5 x 24 cm. The pages read well and quickly you can find what you are looking for by the index. The text layout and choose of typography fits well and reads great, designed in a grid way (similar to how signage is designed). A key factor in signage design & information graphics is the choose of typography, with the choose of typeface you are able to make or break a design and its functionality. 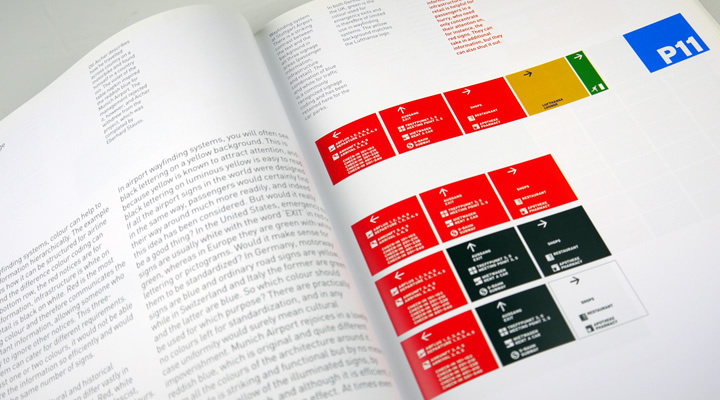 In the book is explained how to choose a typeface and what characteristics a certain typeface needs to have in order to be used in signage systems. Uebele mentions different typefaces that they used in projects and explains the differences between the mentioned typefaces. 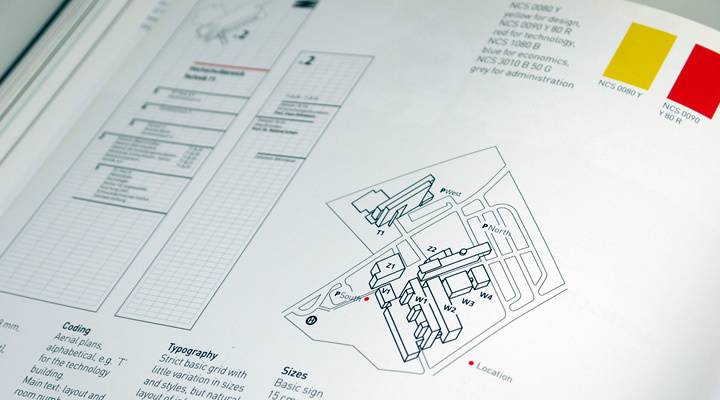 A good introduction into choosing a typeface for signage & information graphics. Further on in the introduction the book goes deeper into designing for signage and which methods to use in order to achieve an effective signage & wayfinding system. With various examples and drawings you quickly read how and what to design. 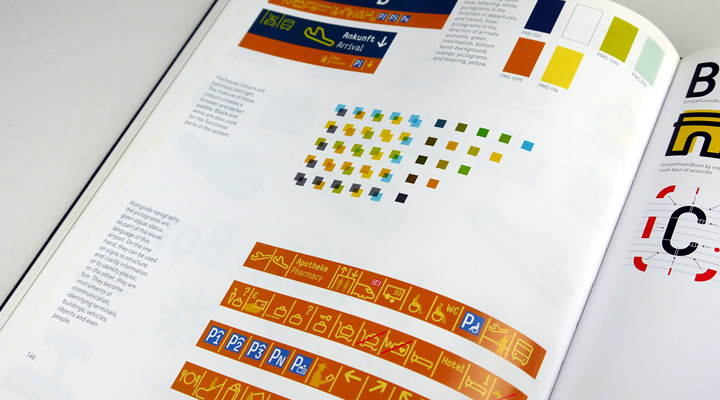 The book explains how to use proper color systems and how to place them into a environment to create a good working signage system. The author explains why they have chosen the color combination, typography and size of the airport signage project described in the book. A great insight in learning more about signage design. Further on there are more projects described and explained with extensive photo material and the actual production drawings. By the drawings you can get a good view of how the signage systems are designed and produced. 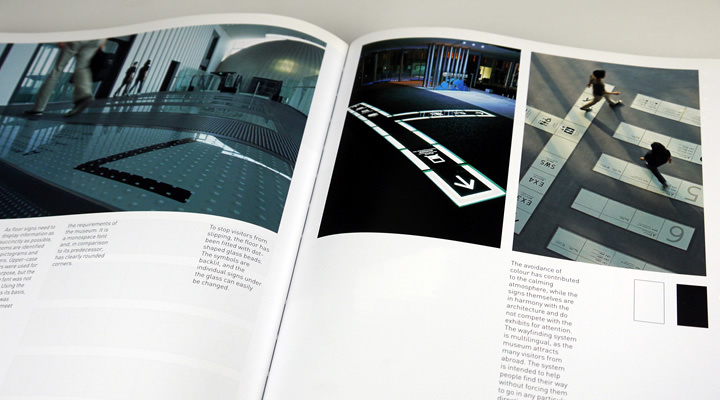 In the book are also described many other projects from different designers and design agencies than Buro Uebele, for instance Schiphol designed by Bureau Mijksenaar. There are various images and concept drawings aswel as the detailed information about typography, color use and more. By adding more information from other designers makes this book a must have reference guide into graphic design and signage systems. You get a clear insight of signage projects which control people in various fields of visual communication and showing them the way. 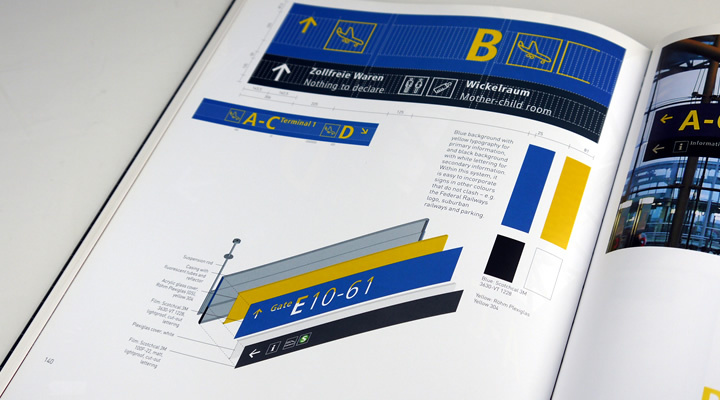 This extensive signage graphics book is available from various resources, see the links below. The corporate website of Büro Uebele.